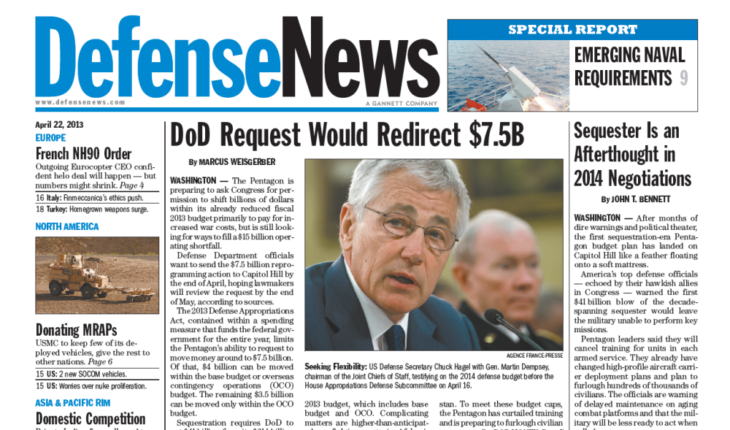 The venerable publication Defense News and along with it Army, Navy, Air Force and Marine Corps Times and Federal Times have been sold by Sightline Media Group, formerly Gannet Government Media. A number of the top executives of Defense News have been dismissed, including its top man Vago Muradian, and the future shape of the company remains unclear. The buyer is Los Angeles based Regent Equity Partners (“Regent”) which also owns www.historynet.com and a number of publications including Military History, America’s Civil War, Vietnam, World War II and Aviation History. Over the years Defense News, widely read by the top echelon of the Department of Defense and by foreign readers in the global defense establishment, focused mainly on Pentagon plans and programs and on the contractors looking for business from the DOD and the military. As a result, despite trying to do some television and modernizing its web presence, Defense News (and its sister publications) has been a niche weekly magazine largely supported by defense company advertising. But, because of a small audience (no matter how influential), advertising could not really sustain these publications. While no numbers have been published, it is a good guess that Defense News and its brethren all were losing money. Indeed, if these publications continued as they were it is almost certain they would remain unprofitable and slow growing, if there is any real growth at all. So what would a private equity firm want to do with a business like this? One early move that Regent will want to make is likely to be to consolidate the management of its existing property, historynet with the new acquisition of Defense News. This could significantly reduce expenses for overhead and bring in better operating numbers fairly quickly. But that really does not solve the overall business model which cannot grow beyond what it is now without a significant refocus. The real play for Defense News in its consolidated form is to restructure and reinvest to compete with History Channel with something like a History and Security Channel or History and Defense Channel. Above all this means doubling down on the cable-TV market space and probably offering multi-platform support. Sports, especially ESPN, today feature programming that users can enjoy on their tablets and smartphones or, as the advertising says, just about anywhere. Interest in technology, defense systems and history is strong, but most of the presentation available today is limited and not well produced. A glimpse of what can be done can be found, of all places, on RT, the Russian news and propaganda TV and Internet outlet. RT has been producing outstanding video of the war in Syria, for example, and is also increasingly reporting events in Europe, using very high quality technology and somewhat less capable reporters and commentators. Apparently RT’s success has contributed mightily to Russian arms sales because Russian systems are featured in a way that was never possible or permitted during the Soviet era. In short, among its other benefits, RT is a money maker for Russia. I don’t want to compare RT to a future history and defense network, but the model is there and Regent, it would seem, has grabbed an exciting property at a presumably low cost, because of the narrow focus on the old niche market served by these publications. I believe the path to making this acquisition into a powerhouse is “un-niching” the niche and creating something new, accessible and exciting. I simply want to say I am just beginner to weblog and actually loved you’re website. Likely I’m planning to bookmark your blog . You surely come with good article content. Bless you for sharing with us your web site. I think other website proprietors should take this website as an model, very clean and great user pleasant style and design.